and meet nutritional wanderings elevating the palate to heaven!! This, 3-hour tour combines fascinating culture and history, ancient architecture and delicious tasting along with the stories that inspired them. Our food and cultural walking tour is suitable for ages -1.5 Mile Walk. Book your tour at the beginning of your stay so you will be informed of all the best eateries and hot-spots of the city. All food and tasting are included in your ticket price. Time: 9:30AM and 5, 30PM on select days -Tour departs promptly at scheduled time. Duration 3 hrs-allow 15 min. grace period. We start from the heart of the city and come to the PLATIA KORNAROU where first visit a small family run shop selling small quantities but high quality cheeses and taste few of them with a shut of Raki. Next break just opposite to drink a cup of Greek coffee the traditional way cooked in hot sand. Keep walking the central market and stop for an OUZO (anise) with MEZE (small bites accompanies the spirit) at one of the traditional Mezedopolion of the street. We will be part of the local noisy people walking / talking / arguing. Visit the cathedral of the city Saint Minas, and then the Morozini fountain at the heart of the city, the Venetian church of Saint Marcus / now gallery, the church of Saint Titus. 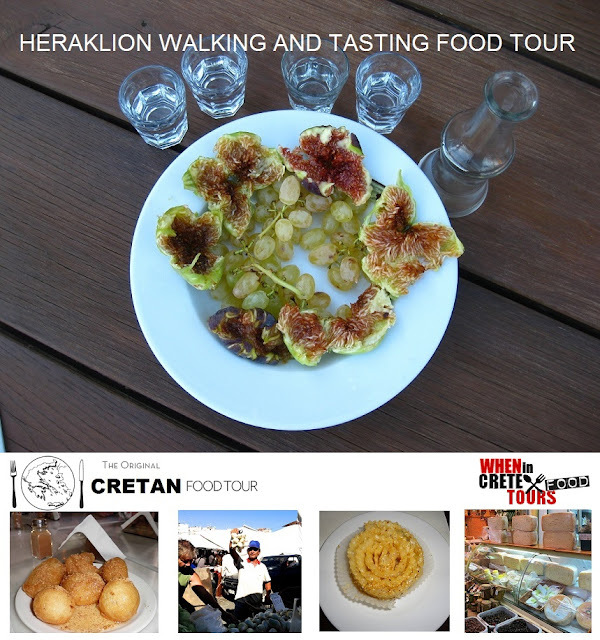 We end our walk after lunch visiting and taste the famous “loukoumades” (Cretan style doughnuts sprinkled with honey and sesame) Lastly a visit to the best small pastry shop in the city. Gloria: Artistic feeling + imagination + pure fresh ingredients = fascinating the palate in taste and quality elevating your senses to heaven: We taste the: Galatoboureko: custard cream and filo pastry in syrup and: trigono:: cheese cream and filo pastry in syrup. Incredible taste never have taste anything like that!! Αναρτήθηκε από George Portokalakis στις 10:23 μ.μ. George Portokalakis 4 Οκτωβρίου 2015 - 10:25 μ.μ.